KIHEI — Sunday was a graduation day of sorts for Jordynn Brown. 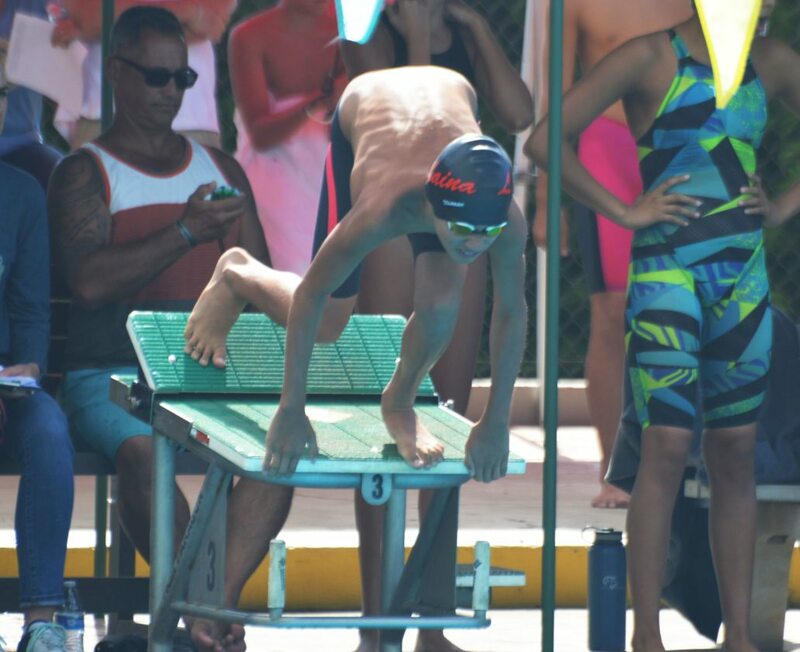 A Hawaii Swim Club standout in the 13-14 age group, Brown won the 100-meter backstroke and finished second in the 400 freestyle Sunday in the state long-course swimming championships at Kihei Aquatic Center. 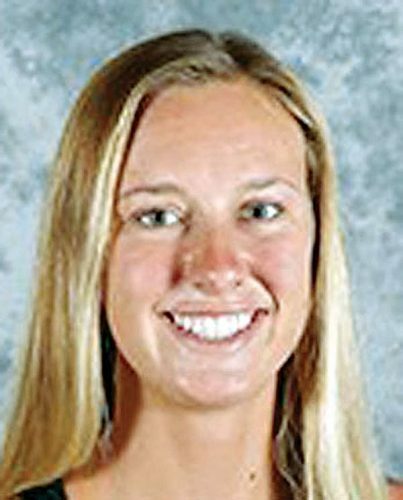 It was the last long-course meet Brown will swim before she makes her Maui Interscholastic League debut for Maui High School. Brown will swim for her club coach, Reid Yamamoto, at Maui High, and will be joining Hawaii Swim Club teammates Kysha Altura and Jasmine O’Brien — both high school state champions — in the MIL. “I’ve been waiting for a long time to be with Maui High,” said Brown, whose mother, Kristine Hayashi, won four straight state titles in the 100 breaststroke for Baldwin in the 1990s. “Knowing what my mom did in high school makes me just want to do better,” Brown said. O’Brien, a junior-to-be at Seabury Hall, won the 400 free on Sunday in the 15-16 age group, giving her a total of four individual titles in the meet — she was also on a trio of first-place relay teams. 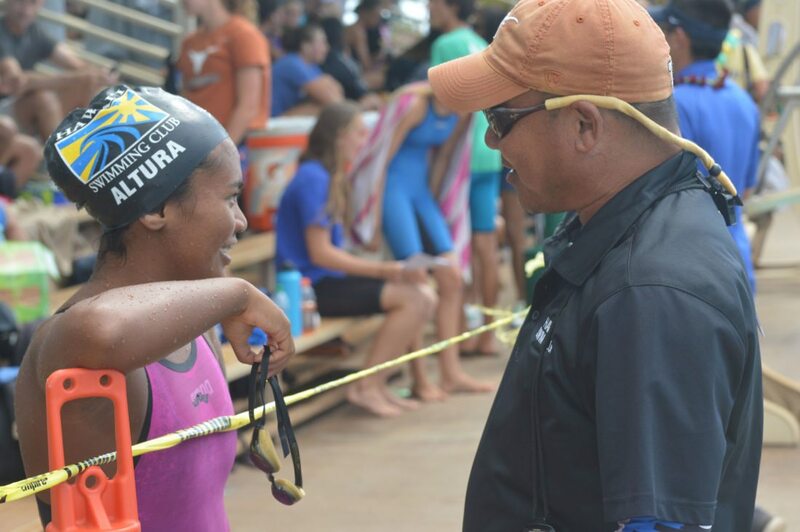 Altura, a senior-to-be at Maui Preparatory Academy, is also looking forward to seeing the new class of MIL swimmers when meets get going in December. Hawaii Swim Club finished second in the team scoring with 1,174 points. Kamehameha won with 2,302. Slater Fleck, who will be a freshman at Maui Prep next month, helped Lahaina Swim Club finish fifth. He was the runner-up in boys 13-14 400 free and fifth in the 200 breaststroke on Sunday. “I’m looking really forward to it, it’s going to be really fun,” Fleck said of high school swimming. Yuna Lee, who is entering the 7th grade at St. Anthony Middle School, won the 200 individual medley in the 11-12 age group on Sunday in 2 minutes, 38.43 seconds, which qualified for the Western Zone meet. It was also her first state title of any kind. “It was pretty tiring, but mostly exciting,” Lee said after her first state title. Lee is a couple years away, but also can’t wait to get to high school competition. Other Maui swimmers to record top-three individual finishes on Sunday were: Hawaii Swim Club’s Kamaile Pellettieri (first place, girls 13-14 200 breaststroke), Karissa Ginoza (third, girls 11-12 50 free) and Carl McNabb (third, boys 13-14 100 back and 400 free); Lahaina’s Lexi Anderson (second, girls 13-14 200 fly), Matthew Iverson (second, boys 11-12 200 back and 400 free), L.T. Stancil (third, boys 11-12 100 fly) and Noah Richard (third, boys 10-and-under 200 IM); Maui Swim Club’s Kaimi Matsumoto (second, girls 15-16 100 back); and the Maui Dolphins’ T.J. Barrett (second, 11-12 200 IM). 1. Kamehameha 2,302, 2. Hawaii Swim Club 1,174, 3. Punahou 693, 4. Aulea 524, 5. Lahaina 390, 6. Splash 385, 7. Kona 331, 8. Academy 267.5, 9. Pearl City 191.5, 10t. Swim Kauai 172, 10t. Iolani 172, 12. Hilo 163.5, 13. Maui 134, 14. Aloha 69, 15. Kona Dolphins 64, 16. Warrior 59, 17. Maui Dolphins 52, 18. Hickam 40.5, 19. Sun-shine 23, 20t. Hawaii Island 14, 20t. Island Aquatics 14, 22. Manoa 6, 23. Rainbow 4. 50 freestyle–1. Sebastian Songsong, Kamehameha, 30.10; 2. X. Rose, Kona Dolphins, 32.08; 3. Ethan DeGalicia, Hawaii Swim Club, 32.75; 3. Jack Fulham, Hickham, 32.75; 5. Kaito Swanson, Hawaii Swim Club, 33.78; 6. T. Koerte, Swim Kauai, 33.79; 7. Kaita Endo, Splash, 34.03; 8. Sebastian Satullo Yamashi, Academy, 34.17. 100 butterfly–1. Ryley Yoo, Iolani, 1:19.24; 2. Sebastian Songsong, Kamehameha, 1:20.72; 3. Jack Fulham, Hickham, 1:23.45; 4. X. Rose, Kona Dolphins, 1:27.89; 5. T. Koerte, Swim Kauai, 1:29.91; 6. Sebastian Satullo Yamashi, Academy, 1:29.99; 7. Enzo Portuondo, Aloha, 1:33.69; 8. Mason Shimabuku, Aloha, 1:34.61. 200 individual medley–1. Ryley Yoo, Iolani, 2:56.92; 2. Hulton Chicoine, Academy, 3:10.98; 3. Noah Richard, Lahaina, 3:12.08; 4. Jack Harris, Hawaii Swim Club, 3:12.54; 5. Masau Lee, Hilo, 3:15.20; 6. Noah Caiserman, Lahaina, 3:15.44; 7. Kaito Swanson, Hawaii Swim Club, 3:16.46; 8. Dezmond Seegmiller, Maui, 3:16.99. 200 freestyle relay–1. Hawaii Swim Club A (Kaito Swanson, Jack Harris, Aiden Alexander, Ethan DeGalicia) 2:22.13, 2. Academy A 2:26.30, 3. Splash A 2:26.96, 4. Lahaina A 2:33.78, 5. Maui A 2:34.17, 6. Swim Kauai A 2:44.13, 7. Maui Dolphins A 2:52.03. 50 freestyle–1. Jakob Honda, Academy, 27.70; 2. Duke Becker, Kona, 27.89; 3. Kai Hayashida, Hilo, 29.00; 4. Mathew Iverson, Lahaina, 29.02; 5. Sebastian Ako, Punahou, 30.01; 6. Nolan Morton, Kona, 30.45; 7. Jake Lee, Splash, 30.80; 8. Evan Wong, Iolani, 31.36. 100 butterfly–1. Jakob Honda, Academy, 1:07.58; 2. Connor Seminavage, Hawaii Swim Club, 1:11.38; 3. L.T. Stancil, Lahaina, 1:15.22; 4. T.J. Barrett, Maui Dolphins, 1:19.64; 5. Landen Otaka, Pearl City, 1:20.92; 5. Aiden Ankrum, Kona, 1:20.92; 7. Jake Lee, Splash, 1:23.11; 8. Clayton Oblero-Laboy, Kona Dolphins, 1:24.71. 200 backstroke–1. Emile Labrador, Kamehameha, 3:05.00; 2. Mathew Iverson, Lahaina, 2:36.74; 3. Nolan Morton, Kona, 2:37.25; 4. Evan Wong, Iolani, 2:40.28; 5. Stone Miller, Kamehameha, 2:41.43; 6. Connor Seminavage, Hawaii Swim Club, 2:45.08; 7. Aiden Ankrum, Kona, 2:46.33; 8. L.T. Stancil, Lahaina, 2:51.76. 200 individual medley–1. Duke Becker, Kona, 2:27.80; 2. T.J. Barrett, Maui Dolphins, 2:41.84; 3. Kai Hayashida, Hilo, 2:42.25; 4. Maison Alexander, Lahaina, 2:47.12; 5. Josh Lee, Punahou, 2:50.90; 6. Emile Labrador, Kamehameha, 2:52.28; 7. Sebastian Ako, Punahou, 2:52.57; 8. Luca Courteau, Aulea, 2:52.98. 400 freestyle–1. Kai Hayashida, Hilo, 4:47.27; 2. Mathew Iverson, Lahaina, 4:50.98; 3. Aiden Ankrum, Kona, 4:58.53; 4. Stone Miller, Kamehameha, 4:58.71; 5. Luca Courteau, Aulea, 5:12.60; 6. Maison Alexander, Lahaina, 5:13.38; 7. Josh Lee, Punahou, 5:20.80; 8. Samuel Ruelas, Kamehameha, 5:22.54. 200 freestyle relay–1. Kona A (Nolan Morton, Keaulana Haserot, Aiden Ankrum, Duke Becker) 2:02.20, 2. Lahaina A 2:03.59, 3. Splash A 2:17.66. 50 freestyle–1. Noah Peters, Kamehameha, 25.47; 2. Devin Alejado, Kamehameha, 25.68; 3. Maximus Chang, Kamehameha, 26.44; 4. 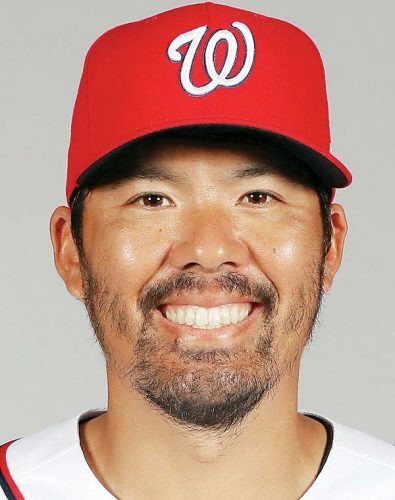 Ryo Ariyoshi, Kamehameha, 26.51; 5. Kaden Parker, Academy, 26.78; 6. Tyson Lin, Punahou, 26.87; 7. Sean Cerizo, Maui, 27.27; 8. Na’inoa Loo, Hilo, 27.60. 100 backstroke–1. Devin Alejado, Kamehameha, 1:04.04; 2. Noah Peters, Kamehameha, 1:05.20; 3. Carl McNabb, Hawaii Swim Club, 1:06.38; 4. Maximus Chang, Kamehameha, 1:06.86; 5. Jon Reiter, Aulea, 1:08.06; 6. Maxwell Lee, Punahou, 1:08.63; 7. Aaron Saito, Hawaii Swim Club, 1:10.76; 8. Zack West, Aulea, 1:12.98. 200 breaststroke–1. Kosmo Wojack, Hawaii Swim Club, 2:31.63; 2. Jon Reiter, Aulea, 2:33.11; 3. Tom Caps, Aulea, 2:36.99; 4. Jaden Yip, Lahaina, 2:42.03; 5. Slater Fleck, Lahaina, 2:44.44; 6. Aaren Orquia, Hawaii Swim Club, 2:48.50; 7. Ken Nakatsu, Hawaii Swim Club, 2:49.37; 8. Na’inoa Loo, Hilo, 2:53.07. 200 butterfly–1. James Lyon, Aulea, 2:16.91; 2. Kosmo Wojack, Hawaii Swim Club, 2:24.77; 3. Aaron Saito, Hawaii Swim Club, 2:24.82; 4. Patrick Garduque, Maui, 2:30.43; 5. Jaden Yip, Lahaina, 2:37.90; 6. Caden Lombard, Kamehameha, 2:38.72; 7. Kai Griley, Academy, 2:47.32. 400 freestyle–1. James Lyon, Aulea, 4:26.75; 2. Slater Fleck, Lahaina, 4:35.03; 3. Carl McNabb, Hawaii Swim Club, 4:36.52; 4. Cameron Wells, Hilo, 4:37.24; 5. Tom Caps, Aulea, 4:38.10; 6. Aaron Saito, Hawaii Swim Club, 4:41.60; 7. Kaden Parker, Academy, 4:42.21; 8. Blaise Swartwood, Kamehameha, 4:45.16. 200 freestyle relay–1. Kamehameha A (Maximus Chang, Noah Peters, Devin Alejado, Ryo Ariyoshi) 1:44.67, 2. Aulea A 1:49.83, 3. Hilo A 1:50.67, 4. Punahou A 1:51.60, 5. Hawaii Swim Club A 1:51.64, 6. Maui A 1:53.10, 7. Kamehameha B 1:55.94, 8. Splash A 1:59.09. 50 freestyle–1. Tyler Kawakami, Punahou, 24.44; 2. Rhys Gough, Aulea, 24.84; 3. Kanoa Sawai, Kamehameha, 25.15; 4. Noah Carlson, Kamehameha, 25.31; 5. Jack Machorek, Swim Kauai, 25.49; 6. Noa Copp, Kamehameha, 25.78; 7. Josh Nekoba, Punahou, 25.97; 8. Ethan Bosworth, Punahou, 26.20. 100 backstroke–1. Michael Petrides, Kamehameha, 59.71; 2. Jaesun Lee, Punahou, 1:03.50; 3. Jaek Horner, Kamehameha, 1:05.02; 4. Jonel Escobar, Hawaii Swim Club, 1:05.18; 5. Silas Wiley, Kona, 1:05.81; 6. Sean Duval-Arnould, Aulea, 1:06.24; 7. Ethan Bosworth, Punahou, 1:07.08; 8. Micah Ginoza, Kamehameha, 1:08.30. 200 breaststroke–1. Jaek Horner, Kamehameha, 2:24.53; 2. Josh Lujan, Hawaii Swim Club, 2:26.18; 3. Matthew Takai, Pearl City, 2:30.23; 4. Austin DeCambra, Hawaii Swim Club, 2:32.22; 5. Luke Faurot, Aulea, 2:32.93; 6. Kanoa Sawai, Kamehameha, 2:34.79; 7. Weylin Foo, Kona, 2:36.40; 8. Reimon Wada, Splash, 2:44.87. 200 butterfly–1. Ray Sakamoto, Punahou, 2:13.14; 2. Jonel Escobar, Hawaii Swim Club, 2:13.96; 3. Jarrett Takahashi, Kamehameha, 2:18.73; 4. Makena Ginoza, Kamehameha, 2:22.18; 5. Noah Carlson, Kamehameha, 2:22.23; 6. Weylin Foo, Kona, 2:24.64; 7. Josh Lujan, Hawaii Swim Club, 2:24.67; 8. Corbin Lofton, Kamehameha, 2:24.84. 400 freestyle–1. Michael Petrides, Kamehameha, 4:07.53; 2. Jack Machorek, Swim Kauai, 4:13.43; 3. Micah Ginoza, Kamehameha, 4:18.63; 4. Jacob Schnitzler, Academy, 4:21.39; 5. Makena Ginoza, Kamehameha, 4:21.57; 6. Brock Imonen, Academy, 4:24.14; 7. Kobe Lilio, Hawaii Swim Club, 4:34.60; 8. Tyler Sakamoto, Punahou, 4:35.76. 200 freestyle relay–1. Kamehameha A (Noah Carlson, Noa Copp, Kanoa Sawai, Michael Petrides) 1:39.77, 2. Punahou A 1:40.59, 3. Kamehameha B 1:44.26, 4. Punahou B 1:46.09, 5. Aulea A 1:46.82, 6. Hawaii Swim Club A 1:48.47, 7. Academy A 1:49.94, 8. Splash A 1:51.86. 50 freestyle–1. Dawson Sloan, Pearl City, 23.67; 2. Joseph Ahia, Splash, 24.42; 3. Jake Gaughan, Punahou, 24.71; 4. Schuyler Cole, Punahou, 25.07; 5. Nicholas Isenhower, unattached, 25.09; 6. Alexander Croll, Kamehameha, 25.91; 7. Sean Kwon, Punahou, 26.03. 100 backstroke–1. Dawson Sloan, Pearl City, 1:02.10; 2. Sean Kwon, Punahou, 1:02.24; 3. Jake Gaughan, Punahou, 1:05.44; 4. Ryan Cohen, Kona, 1:05.61; 5. Nate Barton, Aulea, 1:07.33; 6. Jeffrey Collins, Kamehameha, 1:08.15; 7. Nicholas Isenhower, unattached, 1:08.39; 8. Matthew Olson, Punahou, 1:09.83. 200 breaststroke–1. Jeffrey Collins, Kamehameha, 2:25.49; 2. Christian Nishimura, Kamehameha, 2:26.78; 3. Joseph Ahia, Splash, 2:32.23; 4. C.J. Berg, Kamehameha, 2:36.86; 5. Evan Babcock, Aloha, 2:47.59; 6. Brandon Loi, Rainbow, 2:53.77; 7. Jacob Erban, Splash, 3:01.90. 200 butterfly–1. Jack Lee, Iolani, 2:06.63; 2. Allen Hayakawa, Kamehameha, 2:10.65; 3. Christian Nishimura, Kamehameha, 2:15.27; 4. C.J. Berg, Kamehameha, 2:19.95; 5. Ryan Cohen, Kona, 2:33.33; 6. Evan Babcock, Aloha, 2:37.17. 400 freestyle–1. Allen Hayakawa, Kamehameha, 4:14.28; 2. Denison Piosalan, Kamehameha, 4:14.78; 3. Nicholas Isenhower, unattached, 4:27.99; 4. Jeffrey Collins, Kamehameha, 4:30.73; 5. Matthew Olson, Punahou, 4:32.18; 6. Alexander Croll, Kamehameha, 4:36.69; 7. Asher Robertson, Academy, 4:38.26; 8. Matthew Ostrem, Academy, 4:41.20. 50 freestyle–1. Journei Webster, Aloha, 32.13; 2. Chloe Inouye, Swim Kauai, 32.38; 3. Alyssa Clark, Manoa, 33.66; 4. Tara Ho, Kamehameha, 34.01; 5. Koko Watanabe, Hawaii Swim Club, 34.06; 6. Sage Miller, Kamehameha, 34.13; 7. Abbie Kato, Kamehameha, 34.45; 8. ‘olili’Uwelaakawahin Wis, Hawaii Island, 34.54. 100 butterfly–1. Audrey Hill, Pearl City, 1:18.21; 2. Journei Webster, Aloha, 1:21.48; 3. Abigail Monahan, Kamehameha, 1:23.88; 4. Johanna Zeebe, Kamehameha, 1:25.94; 5. Tea Brandon, Kamehameha, 1:26.36; 6. Kei Nishikawa, Pearl City, 1:28.63; 7. Mahina Dameron, Swim Kauai, 1:29.93; 8. Joyce Wong, Hawaii Swim Club, 1:31.53. 200 individual medley–1. Audrey Hill, Pearl City, 2:53.74; 2. Tea Brandon, Kamehameha, 3:01.76; 3. Journei Webster, Aloha, 3:01.97; 4. Haylie Kaichi, Punahou, 3:04.99; 5. Tara Ho, Kamehameha, 3:05.28; 6. Johanna Zeebe, Kamehameha, 3:08.52; 7. Kaysa Ong, Maui, 3:09.20; 8. Mahina Dameron, Swim Kauai, 3:10.13. 200 freestyle relay–1. Kamehameha A (Tea Brandon, Sage Miller, Abbie Kato, Tara Ho) 2:14.26, 2. Swim Kauai A 2:27.36, 3. Splash A 2:32.02, 4. Maui A 2:33.92, 5. Punahou A 2:50.89. 50 freestyle–1. Christie Jiang, Hawaii Swim Club, 28.45; 2. Malie Nee, Hawaii Swim Club, 29.29; 3. Karissa Ginoza, Hawaii Swim Club, 29.32; 4. Gigi Hioki, Kamehameha, 29.76; 5. Kamaira Silva, Swim Kauai, 30.46; 6. Kaylee Ogawa, Punahou, 30.57; 7. Neve Dagdagan, Splash, 30.59; 8. Sophia Hurd, Punahou, 30.99. 100 butterfly–1. Christie Jiang, Hawaii Swim Club, 1:07.98; 2. Joey Misailidis, Kamehameha, 1:11.83; 3. Malie Nee, Hawaii Swim Club, 1:13.27; 4. Natalie Low, Hawaii Swim Club, 1:13.52; 5. Kiana Wiley, Kona, 1:14.55; 6. Belise Swartwood, Kamehameha, 1:15.56; 7. Tulip Hori, Hawaii Swim Club, 1:16.30; 8. Kai Flanagan, Kamehameha, 1:17.78. 200 backstroke–1. Andrea Zeebe, Kamehameha, 2:34.97; 2. Leila Nasrallah, Punahou, 2:35.55; 3. Charlie Limasa, Hawaii Swim Club, 2:36.97; 4. Neve Dagdagan, Splash, 2:43.58; 5. Natalie Low, Hawaii Swim Club, 2:45.67; 6. Noelle Kim, Pearl City, 2:46.80; 7. Nikki Tabios, Hawaii Swim Club, 2:47.34; 8. Kaylee Ogawa, Punahou, 2:49.04. 200 individual medley–1. Yuna Lee, Lahaina, 2:38.43; 2. Natalie Low, Hawaii Swim Club, 2:41.85; 3. Kai Flanagan, Kamehameha, 2:41.95; 4. Sala Yasumi, Kamehameha, 2:43.33; 5. Noelle Kim, Pearl City, 2:43.34; 6. Belise Swartwood, Kamehameha, 2:45.80; 7. Reina Lileikis, Kamehameha, 2:49.30; 8. Danna Hernandez-Herrera, Lahaina, 2:52.16. 200 freestyle relay–1. Hawaii Swim Club A (Christie Jiang, Karissa Ginoza, Charlie Limasa, Malie Nee) 1:58.23, 2. Kamehameha A 1:59.85, 3. Punahou A 2:02.11, 4. Hawaii Swim Club B 2:06.13, 5. Aulea A 2:06.48, 6. Kamehameha B 2:07.37, 7. Kona A 2:10.18, 8. Kamehameha C 2:10.89. 50 freestyle–1. Sofia Carlson, Kamehameha, 27.68; 2. Maia Damazo, Kamehameha, 27.76; 3. Rose Garcia, Hawaii Swim Club, 28.15; 4. Josie Mobley, Punahou, 28.72; 5. Reina Dreyer, unattached, 28.86; 6. Raven Domingo, Hawaii Island, 29.17; 7. Alana Barthel, Aulea, 29.50; 8. Nathalie Kerrigan, Punahou, 29.73. 100 backstroke–1. Jordynn Brown, Hawaii Swim Club, 1:08.35; 2. Alana Barthel, Aulea, 1:09.84; 3. Mindy Artelli, Aulea, 1:10.12; 4. Yu Ishii, Hawaii Swim Club, 1:10.97; 5. Korrie Tengan, Warrior, 1:11.45; 6. Jen Reiter, Aulea, 1:11.86; 7. Afton Page, Maui Dolphins, 1:12.81; 8. Reina Dreyer, unattached, 1:13.68. 200 breaststroke–1. Kamille Pellettieri, Hawaii Swim Club, 2:49.18; 2. Ashley Zapata, Hawaii Swim Club, 2:53.62; 3. Keanna Campbell, Island Aquatics, 2:56.22; 4. Noelle Sheveland, Lahaina, 2:56.73; 5. Kylie Carter, Hawaii Swim Club, 2:56.81; 6. Lauren Croll, Kamehameha, 2:56.83; 7. Kawena Haserot, Kona, 3:00.61; 8. Katelyn Chua-Chiaco, Kamehameha, 3:02.36. 200 butterfly–1. Grace Monahan, Kamehameha, 2:15.90; 2. Lexi Anderson, Lahaina, 2:30.64; 3. Elena Tanaka, unattached, 2:37.01; 4. Katelyn Chua-Chiaco, Kamehameha, 2:39.55; 5. Aerin Cheung, Hawaii Swim Club, 2:44.49; 6. Emily Munjar, Kona, 2:48.00; 7. Cienna Toyofuku, Splash, 2:49.56; 8. Alana Cayabyab, Swim Kauai, 2:50.42. 400 freestyle–1. Grace Monahan, Kamehameha, 4:31.06; 2. Jordynn Brown, Hawaii Swim Club, 4:38.34; 3. Josie Mobley, Punahou, 4:45.64; 4. Ashley Zapata, Hawaii Swim Club, 4:48.10; 5. Pili Lum, Kamehameha, 4:53.10; 6. Sofia Carlson, Kamehameha, 4:55.66; 7. Reina Dreyer, unattached, 4:56.16; 8. Nathalie Kerrigan, Punahou, 4:58.40. 200 freestyle relay–1. Kamehameha A (Sofia Carlson, Maia Damazo, Lauren Croll, Grace Monahan) 1:54.12, 2. Hawaii Swim Club A 1:54.46, 3. Aulea A 1:58.55, 4. Punahou A 2:00.85, 5. Kamehameha B 2:03.29, 6. Lahaina A 2:08.12, 7. Splash A 2:08.28, 8. Maui A 2:14.73. 50 freestyle–1. Chanel Ng, Punahou, 27.47; 2. Kimi Guevara, Sun-shine, 27.60; 3. Shea Tsuha, Hilo, 28.02; 4. Kate Fujii, Hawaii Swim Club, 28.06; 5. Xaveria Rodriguez, Swim Kauai, 28.53; 6. Ku’ulei Patterson, Kona, 28.68; 7. Emily Nakata, Punahou, 29.35; 8. Kyrie Sasaki, Hawaii Swim Club, 29.48. 100 backstroke–1. Nohea Lileikis, Punahou, 1:09.21; 2. Kaimi Matsumoto, Maui, 1:11.21; 3. Kyrie Sasaki, Hawaii Swim Club, 1:11.35; 4. Erika Howell, Punahou, 1:12.27; 5. Anna Sorensen, Academy, 1:12.61; 6. Ku’ulei Patterson, Kona, 1:15.24; 7. Jade Chismar, Punahou, 1:15.47; 8. Megan Okuma, Pearl City, 1:17.52. 200 breaststroke–1. Maile Lawson, Kona, 2:37.58; 2. Shea Tsuha, Hilo, 2:48.14; 2. Kate Fujii, Hawaii Swim Club, 2:48.14; 4. Jacelyn Ho, Sun-shine, 2:48.51; 5. Mari Yasumi, Kamehameha, 2:51.07; 6. Lyra Gonzalez, Kamehameha, 2:53.03; 7. Kaya Takashige, Hawaii Swim Club, 2:57.39; 8. Ku’ulei Patterson, Kona, 2:57.99. 200 butterfly–1. Shirley Li, Kamehameha, 2:24.03; 2. Lyra Gonzalez, Kamehameha, 2:27.78; 3. Reyna Iwamoto, Pearl City, 2:32.86; 4. Paulina Ruelas, Kamehameha, 2:34.30; 5. Mikaila Domingo, Hawaii Swim Club, 2:36.75; 6. Kaya Takashige, Hawaii Swim Club, 2:37.47; 7. Chelsea Kaneshiro, Splash, 2:44.46; 8. Elsa Kronen, Punahou, 2:45.50. 400 freestyle–1. Jasmine O’Brien, Hawaii Swim Club, 4:25.32; 2. Nohea Lileikis, Punahou, 4:33.02; 3. Chanel Ng, Punahou, 4:44.06; 4. Reyna Iwamoto, Pearl City, 4:47.48; 5. Caroline Short, Hawaii Swim Club, 4:47.52; 6. Erika Howell, Punahou, 4:48.64; 7. Paulina Ruelas, Kamehameha, 4:54.03; 8. Elsa Kronen, Punahou, 4:55.93. 200 freestyle relay–1. Punahou A (Nohea Lileikis, Chanel Ng, Emily Nakata, Erika Howell) 1:52.58, 2. Hawaii Swim Club A 1:53.73, 3. Kamehameha A 1:54.03, 4. Kamehameha B 1:59.22, 5. Splash A 2:02.98. 50 freestyle–1. LeGrand Pound, Iolani, 27.38; 2. Kira Parker, Academy, 27.74; 3. Alexa Phillips, Aulea, 28.04; 4. Karly Noetzel, Academy, 28.22; 5. Lara Yasumi, Kamehameha, 28.25; 6. Echo Baraquio, Iolani, 28.84; 7. Erika Kakazu, Splash, 28.99; 8. Anna Harder, Kamehameha, 29.58. 100 backstroke–1. Lia Foster, Kamehameha, 1:07.39; 2. Erika Kakazu, Splash, 1:07.99; 3. Kysha Altura, Hawaii Swim Club, 1:09.26; 4. Echo Baraquio, Iolani, 1:09.27; 5. Kira Parker, Academy, 1:10.40; 6. Alexa Phillips, Aulea, 1:11.31; 7. Hanna Heiss, Splash, 1:14.46; 8. Alicia Wintermeyer, Lahaina, 1:17.99. 200 breaststroke–1. Aimee Iwamoto, Pearl City, 2:47.84; 2. Abbey Mitchell, Aulea, 2:49.88; 3. Anna Harder, Kamehameha, 2:50.30; 4. Lara Yasumi, Kamehameha, 2:53.11; 5. Tori Oshiro, Kona, 2:57.25; 6. Amanda Le, Kamehameha, 2:59.56; 7. Maia Petrides, Kamehameha, 3:03.82; 8. Amanda Ki, Splash, 3:07.79. 200 butterfly–1. Lia Foster, Kamehameha, 2:22.13; 2. 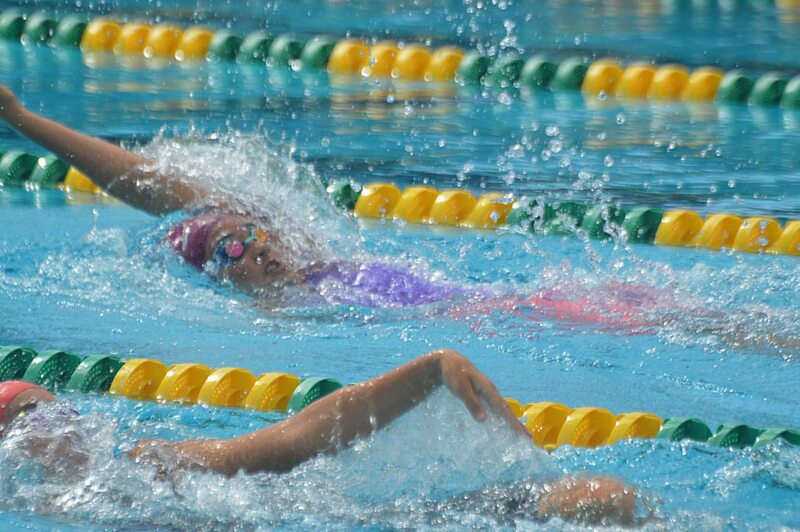 Kysha Altura, Hawaii Swim Club, 2:22.28; 3. Cameron Lyon, Aulea, 2:35.21; 4. Mikaela Nishida, Kamehameha, 2:36.09; 5. Hi’ilani Hopkins, Kamehameha, 2:36.59; 6. Regan Lee, Kamehameha, 2:37.84; 7. Ashton Bliss, Kamehameha, 2:40.59; 8. Ellisa Lang, Kamehameha, 2:41.36. 400 freestyle–1. Maia Petrides, Kamehameha, 4:35.70; 2. LeGrand Pound, Iolani, 4:43.72; 3. Hi’ilani Hopkins, Kamehameha, 4:53.68; 4. Mikaela Nishida, Kamehameha, 4:56.43; 5. Cameron Lyon, Aulea, 4:56.81; 6. Alexa Phillips, Aulea, 5:00.76; 7. Ashton Bliss, Kamehameha, 5:04.55; 8. Tori Oshiro, Kona, 5:12.17. 200 freestyle relay–1. Kamehameha A (Lara Yasumi, Lia Foster, Hi’ilani Hopkins, Maia Petrides) 1:53.33, 2. Kamehameha B 1:57.00, 3. Splash A 2:02.44.